As you all might know last year Mestre Joao Pequeno passed away. As a homage to the Mestre we have asked Austin to take the class this Monday. 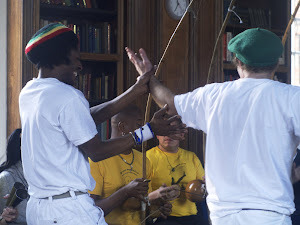 Austin has being doing Capoeira for a lond time since the early 90s when he started. He trained with Mestre Joao Pequeno in Salvador and is still very much commited to what he learnt while in Salvador.